To reach the hallowed entrance of London’s cultural establishment, they skipped past fellow competitors Norman Foster, Frank Gehry, Renzo Piano and a host of other ageing purveyors of big‑budget arts buildings – an unadventurous shortlist, on which the Americans clearly stood out as the most interesting thinkers of the bunch. This will be their first project in the UK, and the stakes are high for the self-styled provocateurs. Most famous for their transformation of a redundant Manhattan railway line into the High Line park, which now attracts eight million visitors a year, DS+R are almost accidental architects. 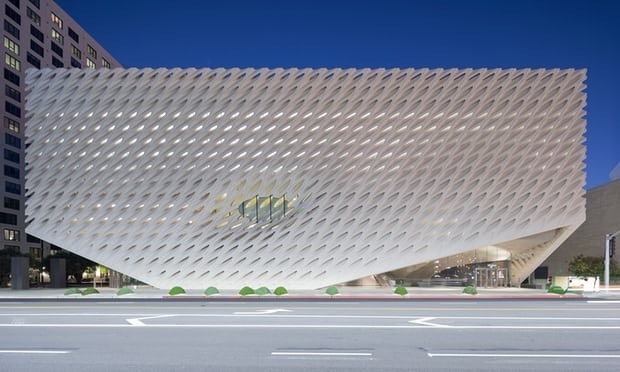 They have recently completed a string of major arts buildings, from the faceted coral rock of the Broad Art Museum in Los Angeles, to the silvery cyclopean slug of the Berkeley Art Museum and the Pacific Film Archive, but for the first two decades of their practice they barely built anything at all. 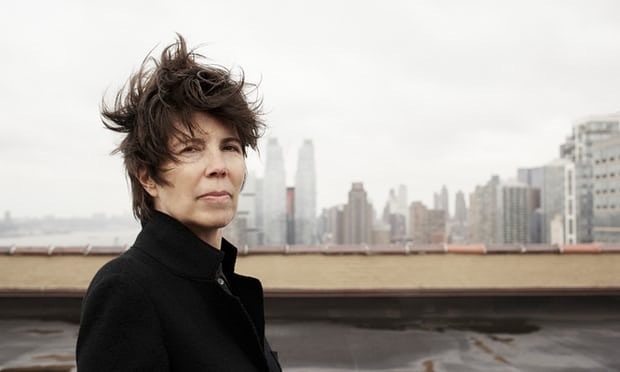 “I never thought I was going to be an architect in the conventional sense,” says Diller, 63, who met her then tutor Ricardo Scofidio, now 82, while studying at the Cooper Union in New York in the 1970s. They started working together on self-initiated installation projects – part of a New York scene that was fizzing with the likes of Trisha Brown and Vito Acconci, Steve Reich and Gordon Matta-Clark – and their sense of mischief soon caught the eyes of curators. They were invited to make something for the project space at the Museum of Modern Art, and took the opportunity to critique the power of the institution, fitting out the room with surveillance cameras and screens to monitor visitors’ behaviour. Twenty-five years later, having been elevated from rebels to royalty in the interim, they unveiled a $450m masterplan to transform the very same museum, only to be met with furious opposition. Their expansion project was accused by artists and museum-goers of representing the “death knell” of MoMA, seen as the greedy institution selling out to commercial interests and trampling one of its neighbours, the beloved American Folk Art Museum, in the process. “I think it was a kind of lightning rod for so many anxieties about the power of MoMA,” Diller said in a 2015 interview. “The expansionist mentality. The previous renovations that people may not have been happy with.” The venom seems to have subsided for now: the first phase of the renovation project opened earlier this year to general approval, their surgical interventions seen to be fixing some of the practical flaws of the rambling warren. DS+R’s shift from fringe radicals to powerful players in New York’s cultural scene hasn’t been an easy one. 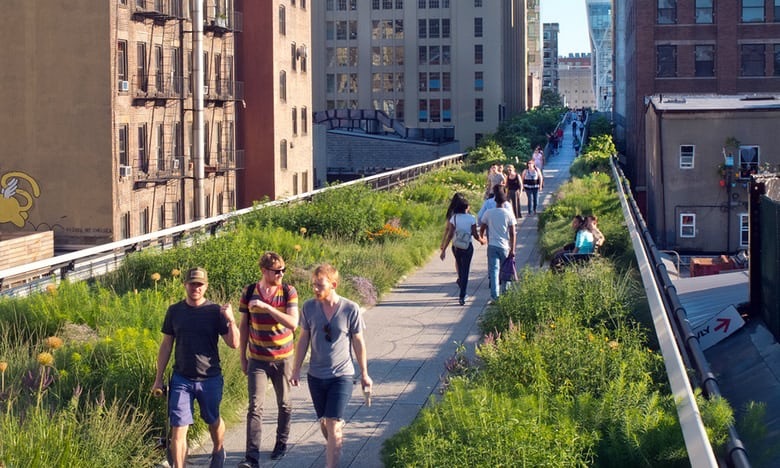 The High Line has also been subjected to a backlash in recent years, mainly due to its phenomenal success. While the project began as a bottom-up activist initiative, it has been identified as the culprit for the super-gentrification of the surrounding Meatpacking District, spawning a cluster of luxury real-estate towers along its green fringes. It has become the template for countless mayors around the world looking to drive up land values in their cities with a little green garnish. 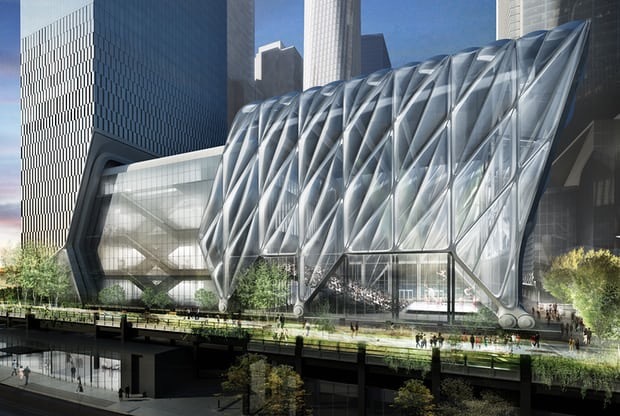 It is a theme they are exploring to extremes in their latest project, The Shed, a $500m centre for the performing arts, designed in collaboration with Rockwell Group and currently under construction at the northern end of the High Line. Looking something like a transparent Chanel handbag on wheels, it will house a vast transformable performance space, with a big open piazza able to be covered by the extension of the movable outer shell, clad with an inflatable skin of quilted pneumatic cushions. 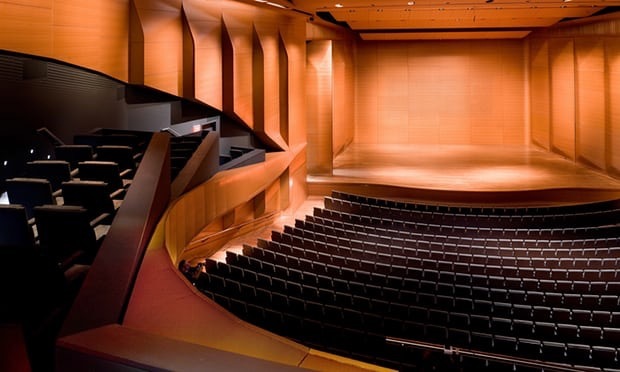 Site and sound … Alice Tully Hall at the Lincoln Center for the Performing Arts, New York. The main challenge will be to make sure it doesn’t feel like a corporate events hall, given that the space will be regularly rented out for fashion shows, product launches and other commercial bonanzas, to help subsidise the artistic programme. Some have scoffed that it is merely a cultural bauble to decorate Hudson Yards, the biggest private real estate development in US history, and it is unfortunate that the Shed will now be plugged in to the base of a 70-storey tower of luxury apartments, also designed by DS+R. The architects land in London on equally rocky ground. Many have questioned the need for the project, which is to be shoehorned on to a tricky roundabout site in the City, currently occupied by the Museum of London. The entire argument for the building, which will be home to the London Symphony Orchestra under the leadership of Sir Simon Rattle, rests on the claim that the acoustics of the Barbican and Royal Festival Hall are not good enough, as Rattle has bewailed. To justify its existence, DS+R’s auditorium will have to sound pitch-perfect to even the most supersonic ears. When UK arts funding is so unbalanced – with a 2014 report finding that Arts Council spending amounted to £68.99 per head of population in London and £4.58 in the rest of England – critics have questioned if this is something the capital really needs. The government withdrew funding last year, so a private fundraising plan is now under way, for which DS+R’s design will have to serve as the crucial bait. Whatever the outcome, with Diller at the helm, it is likely to confound all expectations of what a concert hall might be. By Oliver Wainwright, Reprint from The Guardian, 20 October 2017, © 2017 Guardian News and Media Limited. As fires rage throughout parts of northern California, Governor Jerry Brown has declared a state of emergency, describing the situation as one of the worst firestorms in the state’s history. At present at least 11 people have died, with over 100,000 acres of land scorched by the fires. Evacuations began Sunday night and continued through Monday. Meanwhile, some institutions housing prominent art collections have closed their doors for safety reasons. The Hess Collection, housed in the Napa Valley, announced on its website that it has closed to the public for safety reasons. The museum houses Donald Hess’s private collection, which includes pieces by Francis Bacon, Gerhard Richter, Anselm Kiefer, and Robert Motherwell. 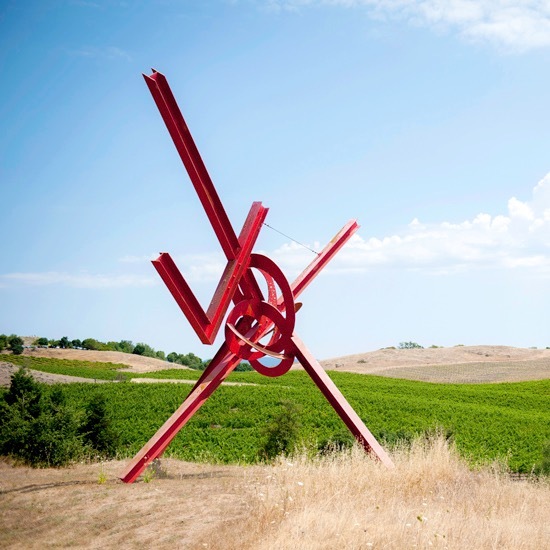 As of Tuesday, another Napa landmark, Stonescape, Norman and Norah Stone’s art-filled property, has so far been unaffected by the disaster, according to a representative for the collection, which contains work by Martin Kippenberger, Jeff Koons, Cindy Sherman, Joseph Beuys, and a site-specific James Turrell. Due to it being a private space, it has not had to contend with public closures. In nearby Sonoma, an official with Oliver Ranch confirmed over the phone that its collection remains safe at present. By Robin Scher, Reprint from ARTnews magazine / ARTnews, 10 October 2017, © 2017, Art Media ARTNEWS, llc. 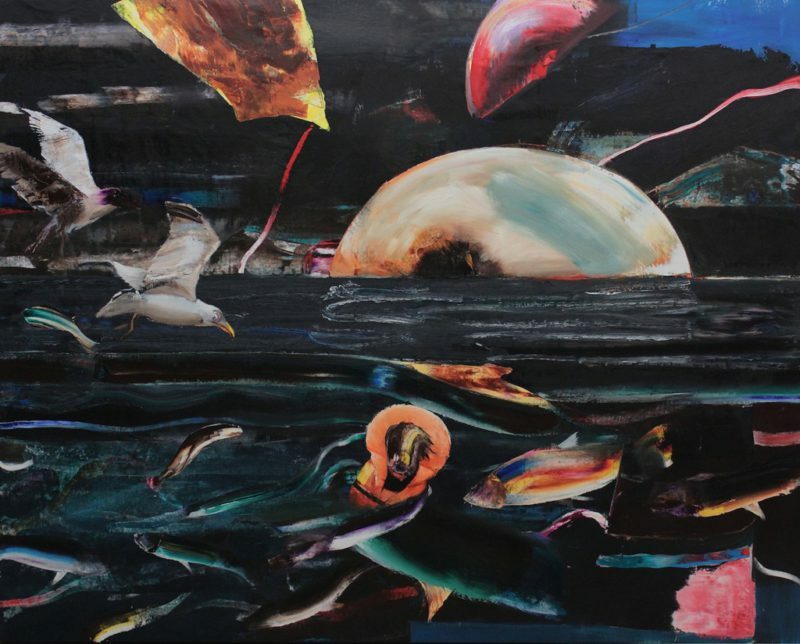 The large and small works in Adrian Ghenie’s “Recent Paintings” show at Pace Gallery in New York—comprising recent paintings, as might be surmised, but also preparatory collages—range from figurative to abstract and back again. 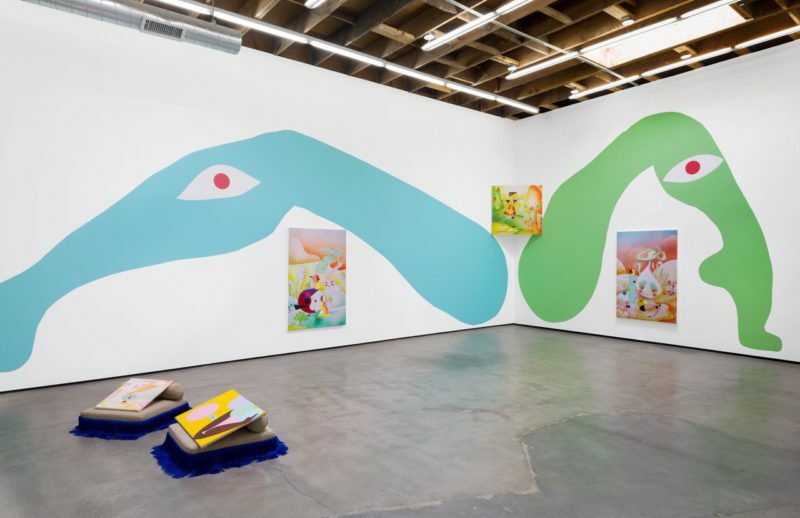 The finer points of such distinctions, however, are beside the greater overall point for an artist who retains a lot of faith in painting as an enterprise. Subject matter, though, can be as concrete as could be imaginable. To the points of reference he has privileged as personal touchstones throughout his career thus far—Tintoretto and the Venetian school, the early Flemish Renaissance, Vincent van Gogh—the 39-year-old artist has added more recent allusions. 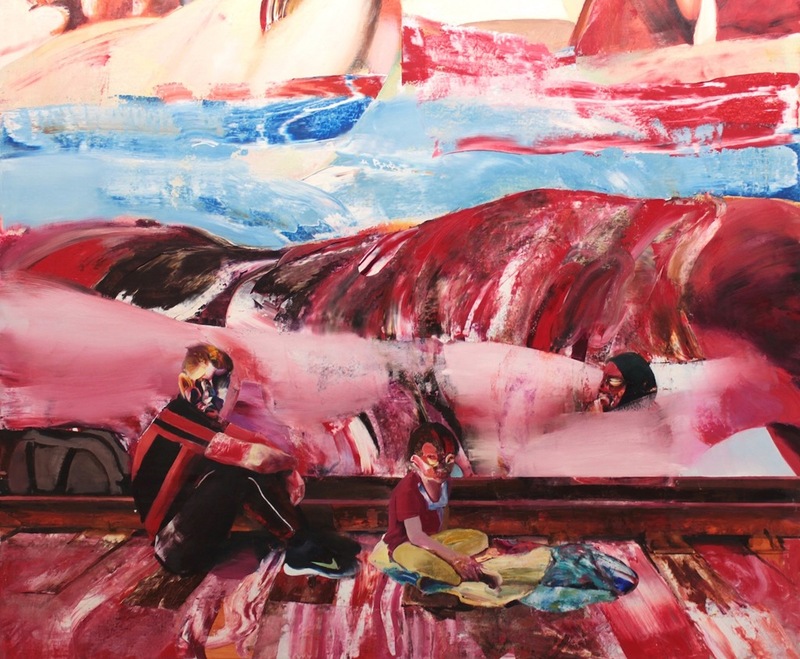 Rest During the Flight into Egypt (2016), full of slashing, sloshing colors (magentas, blues, and reds) and drama that is inescapable at a scale of nearly 10 by 8 feet, draws on the recent refugee crisis roiling Europe. So does Crossing the Sea of Reeds (2016), the same size but darker and more ominous, with gulls and fish spying a water-borne figure bobbing in a lifejacket. Adrian Ghenie, Crossing the Sea of Reeds, 2016, oil on canvas. 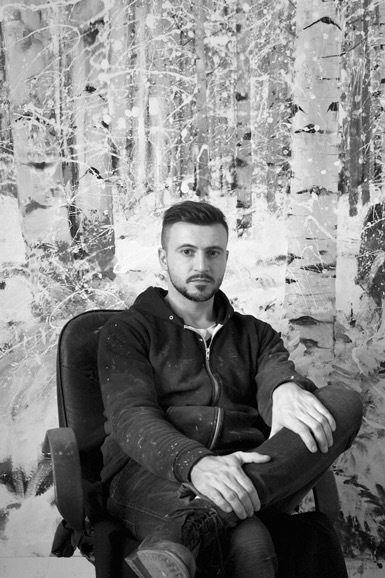 Another subject surrounding Ghenie right now is the ascendance of his work on the market, with paintings of his commanding prices that not all agree are rational—including the artist himself. 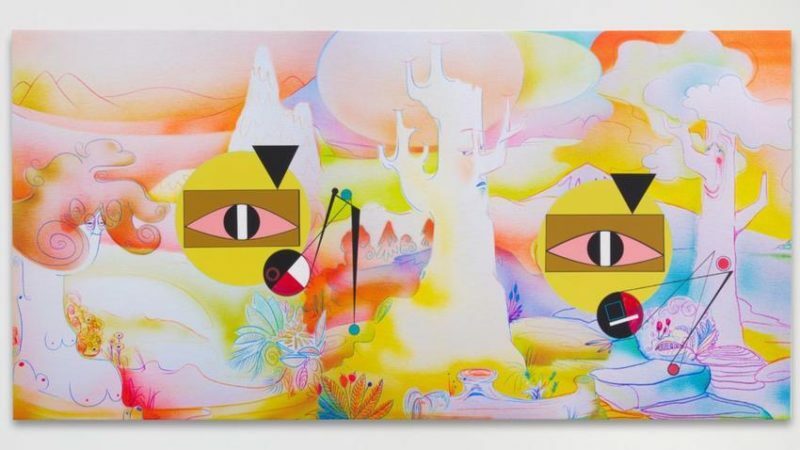 Nickelodeon, a work from 2008, fetched £7.1 million ($9 million) at auction at Christie’s in London last October, and Flight into Egypt(2008) went for $3.9 million in November in New York. 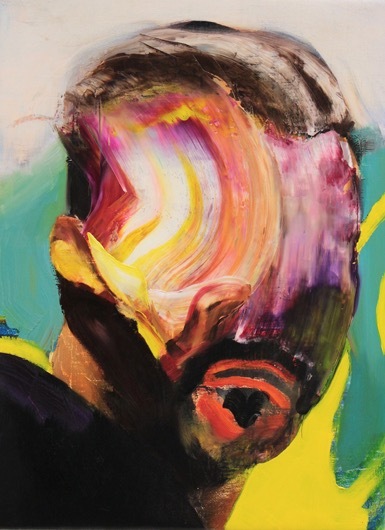 Adrian Ghenie, Self-Portrait, 2016, oil on canvas. By Andy Battaglia, Reprint from ARTnews magazine / ARTnews, 17 February 2017, © 2017, Art Media ARTNEWS, llc. Step into Ad Minoliti’s exhibition at the gallery Cherry and Martin in Culver City, and you feel like you’re drifting through a stranger’s daydream — something better than getting lost in your own reveries. The Buenos Aires-based artist’s whip-smart installation plays host so graciously that its whimsies seem to be yours, but not yours alone. Everything that unfolds in “Geometrical Sci-Fi Cyborg 2.0” (also called “G.S.F.C. 2.0”) results from discrete elements intermingling. The fun starts with the paintings. Minoliti uses stencils to spray-paint canvases. She then photographs her airy compositions, digitally prints the images on other canvases, stretches those canvases and applies more paint. If Wassily Kandinsky came back to life as a middle-school girl wickedly skilled at designing wallpaper, the compositions, palette and touch would resemble Minoliti’s. 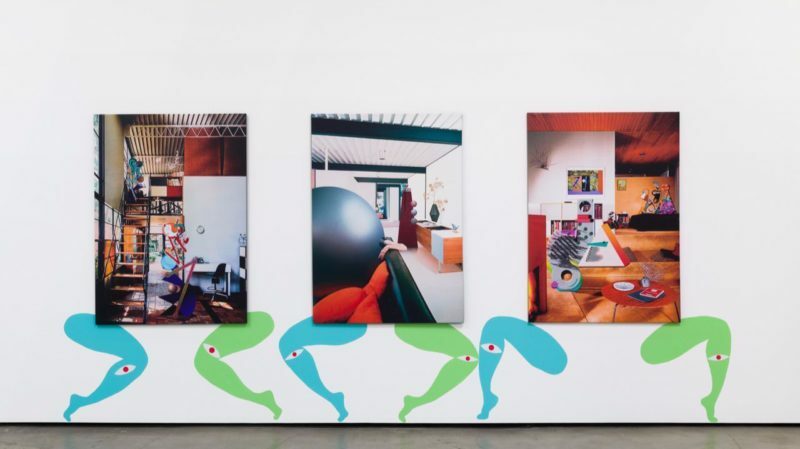 The mischievousness continues in the photographs, each of which transforms a Julius Shulman picture of a classic Midcentury house into a jocular collage that pays homage to its source by reanimating its original insouciance. 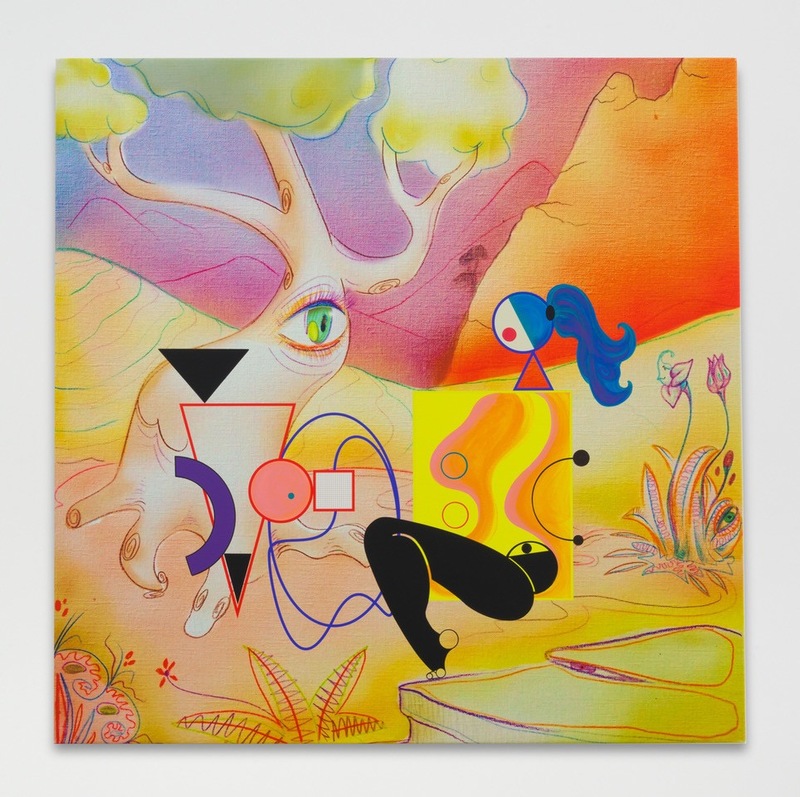 The mix-it-up promiscuity hits a high note with the goofy cartoon murals Minoliti has painted on the gallery walls. Their stark shapes, depicting disembodied legs, wandering eyeballs, a hungry triangle and a happy circle, keep seriousness at arm’s length — without diminishing Minoliti’s ambitions, which are big. 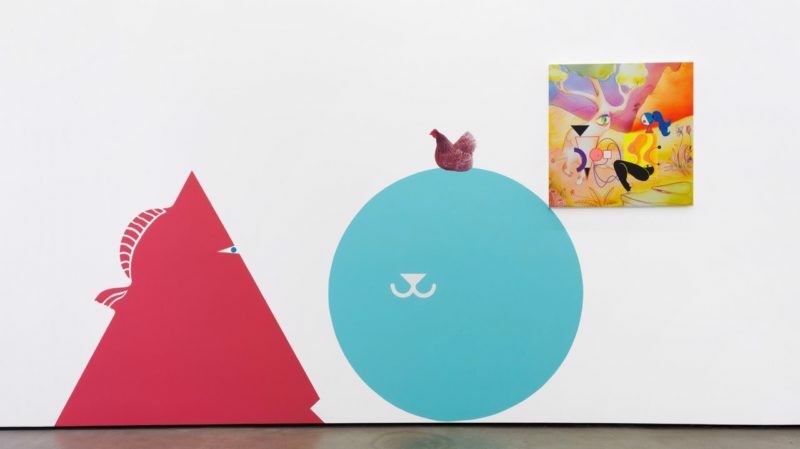 A realistic chicken, perched on an oversized egg (a la Dr. Seuss) is the cherry on top of Minoliti’s playful romp through styles and scales, painting and printing, abstraction and architecture, analog and digital. And that’s not all. The consummate host, Minoliti has made room in her exhibition for a monitor that plays “Mood Rings, Crystals and Opal Colored Stones,” a lyrical video by Zadie Xa, as well as a pair of gorgeous silk cushions — and matching feather-stuffed bolsters — by Yaoska Davila. On each comfy seat reclines a small painting by Minoliti, its abstract eye seemingly riveted to Xa’s dreamy video. Minoliti riffs off artists she admires and invites others into the party.